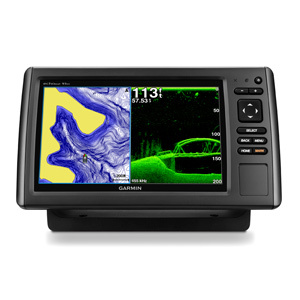 Humminbird 899ci HD SI features the 480′ Side-Imaging technology, which Humminbird began and has mastered. It uses the XHS-9-HDSI-180-T transducer, the same one that was used by the older side-imaging models. The 1000W transducer supports 800/455/200/83 kHz frequencies, and it reaches the depth of 150’ in side imaging mode and 1500’ in broadband mode. The Humminbird 698ci HD SI features a brilliant 640V X 480H, backlit, five inch, 256 color display. It offers precision GPS chart plotting, as well as Down Imaging and Side Imaging sonar. This unit has a tilt and swivel mounting system with quick disconnects and built-in Humminbird UniMap cartography. You can also save your favorite views with three preset buttons that are programmable. The Humminbird 698ci HD SI fishfinder GPS system will enhance the fishing experience for any angler. The Humminbird 398 SI comes with side imaging and down imaging capability in addition to a 3.5 inch screen with LED lighting. Also included is internal GPS chartplotting capability compete with built-in UniMap cartography. There’s also a card slot for when you want to add maps and save waypoints and a Tilt and Swivel mounting system. The Humminbird 598si HD is a powerful GPS/fishfinder combo that makes a day of fishing easier than ever before. This device offers side-imaging to maximize your angling experience, giving clear information on where even the trickiest of fish are hiding. With its Dual Beam Plus Sonar and brilliant full color display, this unit is sure to bring a new level of excitement to the art of fishing. The Lowrance HDS-9 Gen 2 Touch Insight is a touchscreen GPS marine navigational system with the ease of a tablet computer or smartphone. It comes with everything long-time Lowarance High Definition System users expect with a few new enhancements. The Lowrance HDS10 Gen2 is the largest available HDS model on the market. It is a total of 10.4 inches measured diagonally and provides the best viewing experience possible with this family of products. Fisherman and boaters alike can take advantage of the Lowrance HDS7 Gen2 plotter and fish finder. They will have access to a wide variety of options that can improve accuracy of their routes and ensure that they get to the locations where the fish will be biting stronger and in greater frequency. Choosing hardware such as this will require some thought and factual understanding from the consumer. The Lowrance HDS5 Gen2 is a new model for 2012 and it is an improved version of the old HDS5. It features a more powerful processor which gives the fishfinder faster re-draws and quicker response to user input. It has more memory that its predecessor and that allows it store more TrackBack. But the main improvement is the StructureMap a great feature that provides a way to overlay side-scan images on a map display. StructureMap is only available with the optional StructureScan module. With up to 8000w of PTP power output, the Humminbird 998C SI equips the angler with the tools needed to ensure success. SwitchFire Sonar lets you alter the returns you receive based on the fishing and water conditions that exist. Know the size of your potential catch with Selective Fish ID. Get clear detail with split screen zoom capabilities. Combine the technology with an interface that is customizable for your preferences and you will be fishing like a pro. Top of the line features make the Humminbird 898c SI an essential tool for every angler from beginner to pro. Adjust the interface to your own preferences with customizable colors and view selections. Get up close and detailed views with the split screen zoom. Use the X-press menu system to move between features that you frequently. Save your favorite views on the three programmable buttons. Increase your PTP power output to 8000w with an optional transducer and see through the water in brilliant clarity. The Humminbird 798ci HD SI offers the high tech features that you need to make the most of your fishing excursion. With 4000w of PTP power output and a user-friendly interface and menu, this fishfinder is ideal for the angler of any skill level. Dont miss a minute of the action with instant image updates. Take a screen snapshot and send it directly to the memory card so that you can save data as you encounter it. You can even save your favorite views with three programmable buttons available for the job. The avid angler will find the Humminbird 1198c SI HD to be the perfect blend of technology and ease of use. This feature rich fishfinder is backed by up to 8000w of PTP power output. Use split screen zoom to expand on a view that interests you. Instant image update ensures that you are never more than a moment away from the most current information. Apply Selective Fish ID to track and target only the fish you want. Even as you use the extensive components you can customize the interface to have the colors and views that you prefer.